Replace your worn out trampoline enclosure net. Trampoline safety enclosure nets provide safety for kits, teens teens and adults, keeping kids from falling outside and hurting themselves, also provides protection against the frame of the trampoline. The net is made of high quality mesh material and installed on the outside of the frame. Add the safety pad to ensure maximum safety. Easy to install, no tools required. Simply slips on straight poles up to 2 inches in diameter. Affordable and reliable safety for your trampoline. Specially designed for trampolines with 10 straight poles. This enclosure net is designed to fit 14 foot trampolines. 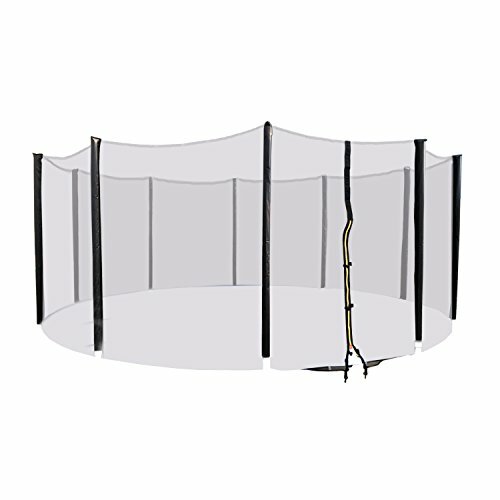 Provide safety to your trampoline, 70 inch high safety net enclosure.